Sales of Lada cars, seen here at a St. Petersburg dealership, fell 15 percent last year. MOSCOW -- Russian car sales are likely to drop by 24 percent this year after falling 10 percent in 2014 as the country heads for recession, an automakers lobby group forecast. New car and light commercial vehicle sales are set to decline to 1.89 million vehicles from 2.49 million last year, Joerg Schreiber, the chairman of the Association of European Businesses automobile manufacturers committee, said today at a news conference in Moscow. Philippe Saillard, head of Nissan in Russia, said the 2015 forecast was "slightly higher" than the level he expected, while Suzuki Motor said the outlook was "very optimistic." "We would say somewhere between 1.5 and 1.7 million," Koichi Takakura, the Russian director at Suzuki, told Reuters. Schreiber said last year's sales drop eased in November and December as consumers rushed to buy big-ticket items as the ruble collapsed. December sales rose 2 percent to 270,600 vehicles, according to the industry group's data. The ruble plunged more than 40 percent last year in Russia's worst currency crisis since 1998. Carmakers have slowed production and raised prices in response. High interest rates will probably hold down car sales this year, and the ruble exchange rate remains a headache for automakers, Schreiber said. He said some car models may be forced out of the market, but declined to name which. Car sales have fallen victim to Russia's weak economy, hit by Western sanctions imposed on Russia over the Ukraine crisis and low oil prices. 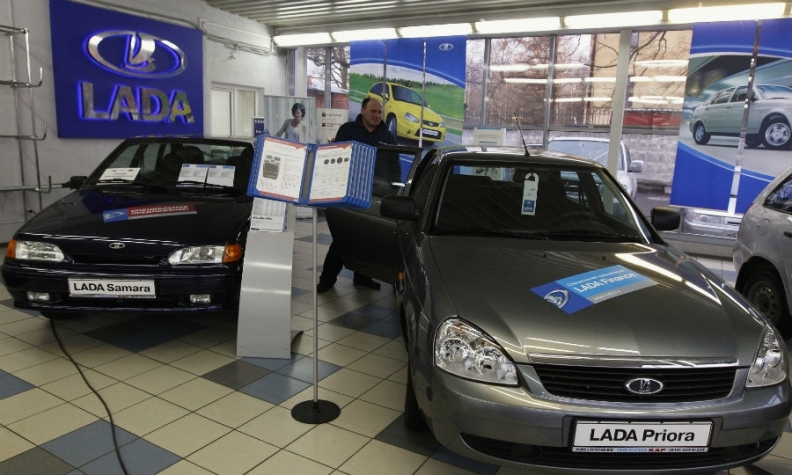 Lada, Russia's top-selling brand, saw sales decline by 15 percent in 2014. Sales at No. 2 Kia fell by 1 percent. Volume at Nissan, Russia's third best-selling brand, grew by 11 percent. Major Western brands suffered large drops with Ford down 38 percent, Opel 20 percent, Chevrolet 29 percent, Volkswagen 18 percent and Renault 7 percent. Toyota's volume rose by 5 percent. Download PDF, above right, for Russia car sales by group, brand and model.